“EARLY BIRD PRICING UNTIL JULY 1! Register at zone4.ca by midnight, July 1, for only $30 (plus insurance). Fees increase to $40 (plus insurance) from July 2 to 5:00 pm July 12. Race day registration is $50 plus insurance. Register now at zone4.ca to ensure your spot in this fun annual event. 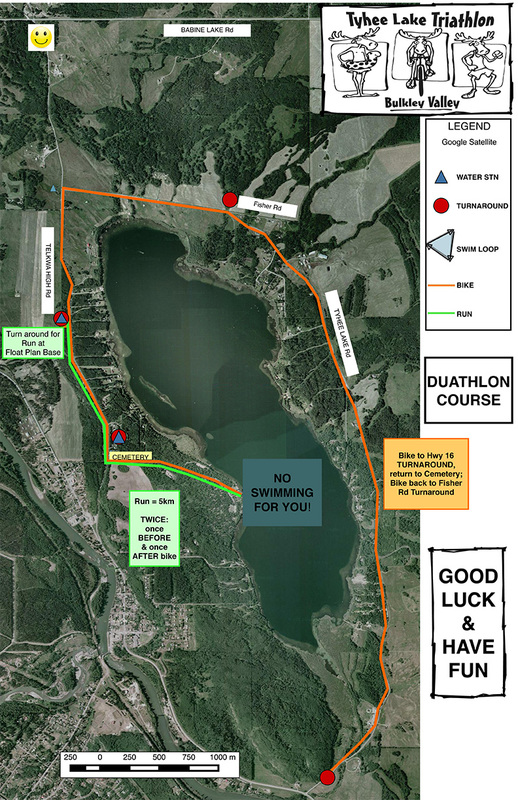 The Tyhee Lake Triathlon is an annual event that takes place near Smithers, BC. It is a great race for those new to multi-sport events and for competitive racers alike, and is one of the most affordable races in the province. The event is sanctioned by TriBC and includes youth, junior, masters' and team Triathlon categories, as well as a Duathlon option for those who prefer to stay dry. The course is well-marshalled by enthusiastic volunteers. Mandatory bike check at 8:00 am (including for those on sprint triathlon teams). The Standard Distance Triathlon and Duathlon begin at 9:30 and the Sprint Triathlon and Try-a- Tri waves start an hour later at 10:30. The lake swim is supervised by qualified lifeguards and numerous volunteers in kayaks and on SUPs. Lake temperature is comfortable for swimming, and wet suits are allowed but not required unless the water temperature drops below 16°C. 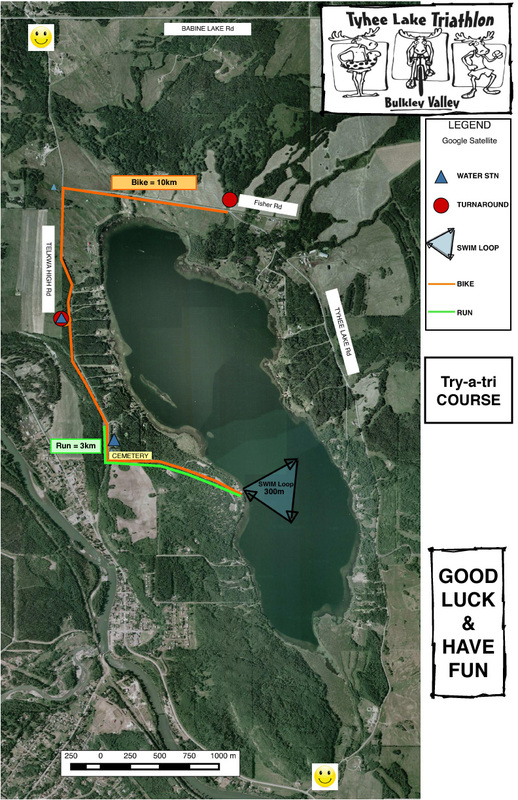 The bike course follows the road around Tyhee Lake and is well-marshalled by volunteers; cyclists should bring their own water as there are no water stations on the bike route. The run takes place on rolling, quiet, rural roads and there are water stations spaced along the route. The race finishes with a gentle descent into Tyhee Lake Park where you'll cross the finish line to cheering spectators. After the race there is a great BBQ and lots of draw prizes. Camping is available in the park. 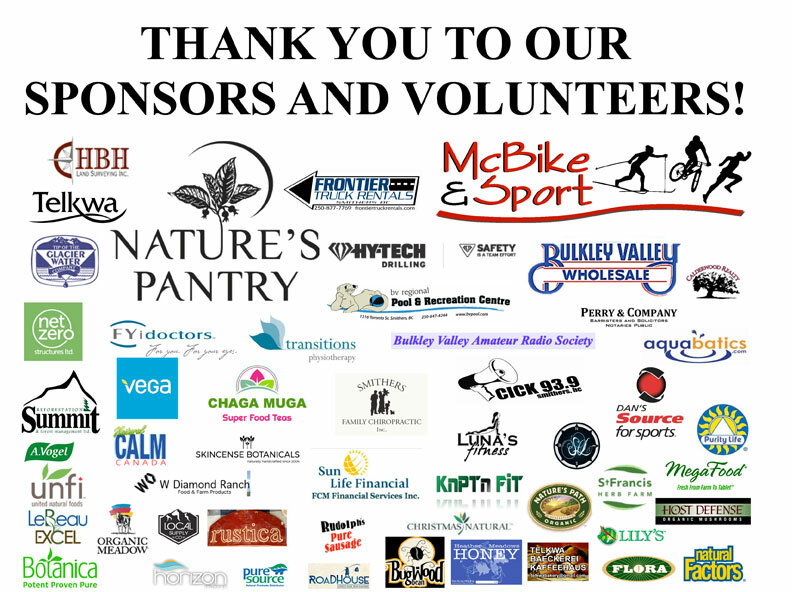 Registration can be done at https://zone4.ca/register.asp?id=20563, starting on February 21 (credit card required) or you can return a completed entry form and payment to Nature's Pantry, 3744 First Ave. Smithers (cheques can be made payable to Tyhee Lake Triathlon). Deadline to register to save money and guarantee your spot is Wednesday, July 1 at 12:00am. Until midnight July 1, registration costs $30 (plus insurance); from July 2 to 5:00 pm July 12 it is $40. Race day registration is $50 per person (plus insurance). You must be at the Park by 8:00 to participate. Organizers reserve the right to cap the number of entrants for safety reasons. Race organizers will make every attempt to clearly mark the race course, but participants are responsible for making sure they learn it prior to racing. Please have a look at the maps! The triangular 750m swim course is well-marked with large buoys and starts at the beach below the transition area. Racers swim two laps in a clockwise direction. There is a 100m run from the swim finish to the transition area, on grass. The out and back 20km bike course runs clockwise around Tyhee Lake – up the Park Rd, right on Telkwa High Rd, right onto Tyhee Lake Rd out to a turnaround near Hwy 16. Return to the turn-around at the cemetary before heading out on a second loop. The run course is also an out and back. From the transition area, head up the Park Rd and right onto Telkwa High Rd. The Standard distance 10km run turns around near Babine Lake Rd (Eckman). There are four water stations along the 10km run course. The triangular 750m swim course is well-marked with large buoys and starts at the beach below the transition area. Racers swim one lap in a clockwise direction. There is a 100m run from the swim finish to the transition area, on grass. The out and back 20km bike course runs clockwise around Tyhee Lake – up the Park Rd, right on Telkwa High Rd, right onto Tyhee Lake Rd out to a turnaround near Hwy 16. The Sprint course is one loop. The run course is also an out and back. From the transition area, head up the Park Rd and right onto Telkwa High Rd. The Sprint distance 5km run turns around near the road to the float plane base. There are two water stations along the run course. The triangular 300m swim course is well-marked with large buoys and starts at the beach below the transition area. Racers swim to the first large buoy and then turn right (clockwise) to swim to the next buoy across – a separate kayaker is designated to this group. The out and back 10km bike course runs clockwise around Tyhee Lake – up the Park Rd, right on Telkwa High Rd, right onto Tyhee Lake Rd out to a turn-around at Fisher Rd. The Try-a- Tri 3km run turns around about 200 m right of the Park Rd; there is one water station. The duathlon begins at the beach below the transition area. From the transition area, head up the Park Rd and right onto Telkwa High Rd to a turn around near the road to the float plane base and return to the transition area. The bike course runs clockwise around Tyhee Lake – up the Park Rd, right on Telkwa High Rd, right onto Tyhee Lake Rd out to a turnaround near Hwy 16. Return to the bike turn around, near the cemetary, and head back out to Tyhee Lake Rd, turning around near Fisher Rd before returning to the transition area to start a second 5km run on the same course as the first.